“But he said, ‘O Lord God, how am I to know that I shall possess it?’” (Gen. 15:8). Having established that Jesus does not forbid all oaths, it will be helpful for us today to discuss why oaths are necessary in the first place. Why do we ever make vows? Can we not really trust the word of our neighbor? All of us have found too often that the answer to the latter question is “no.” All of us have at one time or another felt the sting of betrayal when promises made to us were not kept. The breaking of marital vows, contracts, and political promises are all a source of much grief in our society. We should not really be surprised that man has a propensity to break his vows. After all, both Scripture and our experience readily confirm the psalmist’s statement that “all mankind are liars” (Ps. 116:11). If humanity kept its promises at all times and in all places, there would be no need for regulations regarding lawful oaths and vows in the first place. Making oaths is a law that God gives us in light of our sinful condition. It helps protect the sanctity of truth and preserves the most important structures of society. Remarkably, even God Himself has sworn oaths. In today’s passage we read of the promise God makes to Abram to give him and his descendants the Promised Land (Gen. 15:1–7). 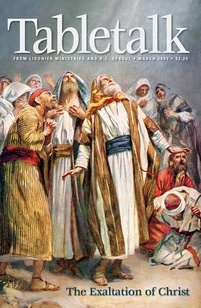 Abram doubts God and asks how he will know that God will keep His promise (v. 8). In His mercy, God does not strike Abram dead for questioning His veracity but rather swears an oath to Abram that He will keep His promise. In passing between the carcasses of dead animals, God swears by Himself that He will meet the same fate should He not fulfill His promise (vv. 9–21). This oath was sworn in order to bolster our trust in God’s promises — not because God would ever break a pledge to us. Moreover, it helps to show us when it is appropriate to make oaths. We have already seen that as Christians, our speech is to be trustworthy so that we need not make oaths for ordinary occasions or promises (James 5:12). However, Genesis 15 shows us that when solemn covenants and agreements are made, it is appropriate to swear an oath. The fact that God swore an oath when He initiated the Abrahamic covenant demonstrates that oaths are appropriate when we make life-regulating agreements. Remarkably, society has always recognized this through things like marriage vows, ordination vows, and, to a lesser degree, business contracts. If you are married, find a way to reaffirm your vows with your spouse. Whatever your marital status, ask God to help you keep any other vows you have taken.